The Life of Labour, a compilation of important labour developments from around the world, will be delivered to your inbox every Sunday at 10 am. Click here to subscribe. Led by the Asanghadita Mekhala Tozhilali Union (AMTU), women workers from Kerala have won the right to take a seat at work. The Better India reports that the shop owners had extremely harsh rules for their employees to follow, including forbidding their employees from sitting or leaning against the wall during work-hours, limiting their lunch breaks and their bathroom breaks and that “talking to colleagues… could result in loss of pay.” The union took the matter to court and has been fighting the cause for almost eight years. Now, the Kerala Shops and Commercial Establishments Act is going to be amended to allow workers the ‘right to sit’. The leader of the AMTU, Viji, told the Times of India that “The shop owners, including the Kerala merchants’ union, had said that if people wanted to sit or use the toilet, they should just stay at home”. This is a small example of how workers have to mobilise the entire state and judicial machinery even for something as small as resting at work. 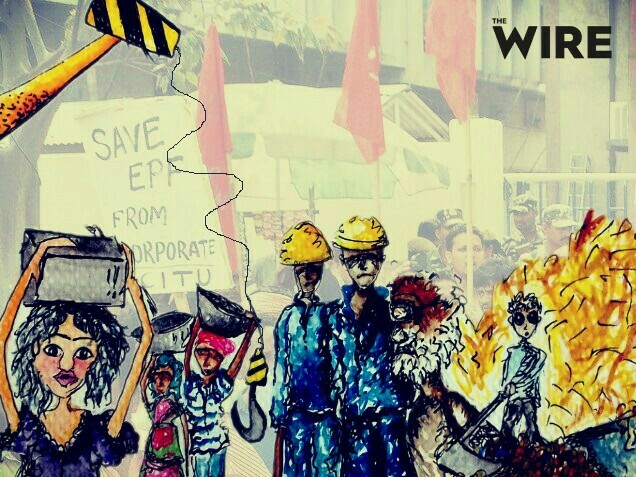 In a major victory for workers, the intervention of the Workers Rights Consortium (WRC) has led to (some form of) justice for the workers of Shahi Exports, one of India’s largest garment exporters. When workers began to unionise at one of Shahi Exports’ many factories, the managers became vindictive and suspended them. The report by WRC documents death threats, casteist attacks and violent misogyny. The reported threats are terrifying – “These whores are trying to close the factory. Beat her and kill her.” The Guardian reports that the worker “was then beaten and had her clothes torn and her necklace, mobile phone and handbag stolen.” When WRC first asked Shahi Exports to take action they refused, claiming the managers had done nothing wrong. Then WRC released a report and began to put pressure on their high-profile clients like H&M, Benetton and Abercrombie & Fitch. 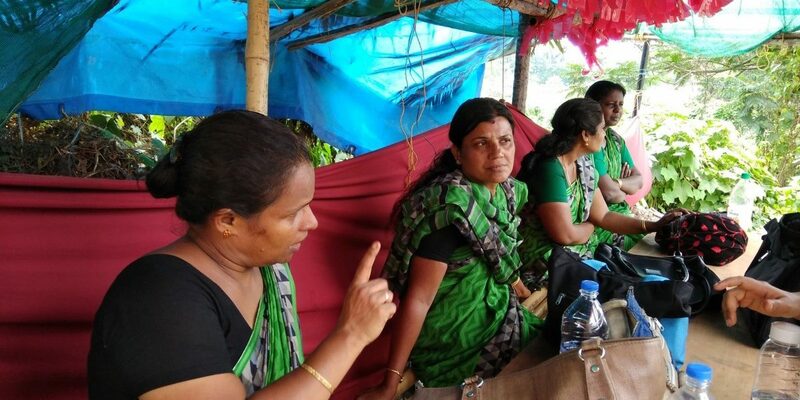 Finally, three months after the violence, the company has begun to take action – terminating the managers, reinstating the suspended workers, paying them back pay and agreeing to negotiate and recognise the Karnataka Garment Workers’ Union. Transporter vehicle owners began an indefinite strike on July 20 demanding that fuel is brought under GST to reduce the tax burden, fuel prices are revised every 6 months instead of daily and the toll tax is collected on an annual basis to reduce delays. The All India Transport Workers Association claims that the strike was a massive success on the first day. The strike follows unsuccessful talks with the Union Transport Minister and the acting Finance Minister. It is not clear if the drivers and other workers will be paid for the period of the strike as they are caught in the crossfire between the state and truck owners. The News Minute reports that Bangalore’s construction boom has led to workers being offered better conditions by construction companies. These 15-20 lakh migrant workers mostly come from northern states like Odisha, Jharkhand and Bihar. Apparently, the labour contractors who bring these workers to construction sites are incentivised to bring them to high-paying companies because they get paid through a share of the wages. Builders like RMZ have also built semi-permanent housing with electricity and water facilities. But if this has become the criteria for praise then we are truly scraping the bottom of the barrel. These builders get to use their CSR funds to set up the minimum facilities for their workers. These facilities need to become the norm, not outliers. 45 days since the closure of Sterlite Copper Smelter in Thoothukudi, Tamil Nadu, the Vedanta Group that operates the plant has recalled all the workers of the plant to present themselves regularly from July 16. These workers had been given leave or transferred to other facilities after the government of Tamil Nadu decided to close the factory for violation of environmental regulations. The order for closure had come after the massive protest by residents of Thoothukudi and adjoining villages turned bloody after police opened fire on the protestors, killing 13 people. The company has been arguing that the whole affair is a smear campaign by NGOs and vested interests. They have launched a PR exercise to claim their innocence and as a way to put pressure on the government to rescind the closure order, have asked their workers to present themselves regularly to work at the staff quarters. An e-mail sent by Sterlite Copper CEO Ramnath said: “[Vedanta] Chairman wants this time to be utilised to building a new approach to all that we do in Sterlite Copper – concentrate (on) procurement, logistics, production process, commercial, marketing, housekeeping, business excellence, CSR, PR, finance, IT, maintenance, etc… all of you have to work on these aspects.” When contacted by The Hindu, M. Esakkiyappan, a spokesperson for Sterlite Copper, said the move was to ensure the employees were not kept idle for a long time. Given these efforts by Vedanta to restart operations at the copper smelter, the villagers have written to the Tamil Nadu government not to rescind the order and instead move towards permanent closure of the factory that has caused enormous pollution to their environment. A ‘Mazdoor Sangarsh Rally’ was called by the Maruti Suzuki Mazdoor Sangh on July 18. Apart from hundreds of workers belonging to the four Maruti Suzuki plants in Gurugram, nearly 20-25 workers’ unions from various factories including Rico Auto, Honda Manesar, Honda Tapukara, Lumax, Satyam Auto, Daikin, Munjal Showa, Endurance etc. located in Gurugram, Dharuhera, Bawal and Neemrana attended the rally. The workers were protesting against the continued incarceration of several Maruti workers in the case related to the violence that erupted at the factory in 2012 following a strike by Maruti workers for better working conditions. The death of the manager at the Manesar plant was used by the management and government to throw nearly 150 workers, including the entire union leadership, in jail for murder. After 5 years of court cases, 117 workers were acquitted but the rest were held guilty with 13 getting life imprisonment. The company also used this as a pretext to dismiss over 500 workers who were at the forefront of unionisation. This verdict has come under criticism by workers who have held protest demonstrations, raised money for the workers’ legal and personal expense and provided support to the incarcerated workers. 345 workers of the Chowgule mining company in Sesagoa, Goa won their jobs back after the labour department rejected the application by the company to retrench the workers following a stop to all mining operations in Goa. The union had successfully challenged the application and the government has also refused to grant permission. While the company might appeal the order, the workers will have to be compensated until the courts decide on the issue. Many other mining majors including Vedanta’s Sesa mining company had resorted to retrenchment of workers after the Supreme Court banned mining pending the cases of corruption and ecological damage due to illegal mining of Iron ore.
Mamata Banerjee has threatened to cancel the land leases of tea estates if they fail to run properly. She also stated the intention of her government to recommend Rs. 176 as the daily minimum wage for tea garden workers. It is Rs. 159 a day currently. This comes in the wake of a number of tea estates being closed down in the recent past. The producers have claimed a glut in supply for the fall in revenue from tea estates but the West Bengal government has strongly supported an increase in minimum wage and even suggested to the central government to either manage the tea gardens that have closed down in West Bengal or allow the state government to deal with the issue. The state government has also constituted a committee to recommend policies and programs to improve the lives of over 8 lakh people who are dependent on the work in tea estates for a living. The Kerala labour department stopped work at three construction sites after its inspections revealed that safety standards for workers were being flouted. “When we inspected the construction site, labourers were not following any kind of safety measures. They didn’t use safety belts, barricades, helmets or other safety equipment at the construction site,” said District Labour Officer V B Biju who conducted a surprise visit as per the direction of the Regional Joint Labour Commissioner K Sreelal. The inspectors also found that the wages were not being paid on time and that the labour quarters were in an unhygienic condition. 103 workers at CDK Global were retrenched this week, bringing back memories of large-scale retrenchment in the IT industry. The Forum for IT Workers in Hyderabad has taken up their case and is planning to file petitions with the Telangana labour and factories departments against the termination. The union has termed the retrenchment of the workers illegal. Amazon employees across Europe went on strike on ‘Prime Day’, the company’s flagship sale. It began with 1,000 workers announcing a strike in Spain. Soon, workers from Germany and Poland joined the strike. There were reports that the police cracked down on strikers in Spain, detaining three and injuring one. While there have been numerous reports on the strike, most media have not engaged with the workers beyond the most basic reporting. The workers are fighting for better working conditions, pay and health benefits. Amazon is disputing the effectiveness of the strikes and ‘Prime Day’ is still set to be one of their highest grossing sales but with each action, more and more of the public are becoming aware of what their discount dollars are also buying.